are qualified HSC exam they are eligible for this MSSC Security Guard Recruitment 2017. 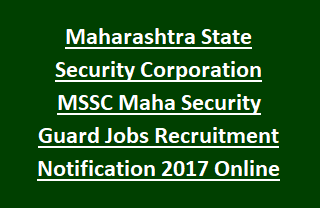 There are total 1000 Security Guard Vacancies in this MSSC Maha Security Guard vacancy recruitment 2017 notification. Last date for online application form submission through MSSC official website of mahasecruity.gov.in is 20-12-2017. Applications form for this Maha Security Guard jobs will be accepted through MSSC website only. Candidates selection for this Maha Security Guard jobs will be based on Physical tests, running test and merit in HSC exam. Pay Scale, Selection Procedure, application form submission details online and other information is given below. 18 to 28 years as on 01-12-2017 and candidates must have born on or after 30-11-1989 and before 30-11-1999. There are total 1000 Security Guard jobs in this MSSC Recruitment 2017. Selected candidates will receive monthly salary of Rs.14000/- including ESI +PF. Candidates must have qualified HSC or 12th class. Application fee for this MSSC Security Guard jobs is Rs.200/- to be paid through NEFT. Candidates will be selected based on merit in HSC qualification, Physical measurements test and running test. Running Test: Candidate have to clear the 1600 meters running. Running will be conducted for 50 marks. First attempt Weightage only consisted for this Security Guard jobs in Maharashtra State Security Corporation recruitment. Interested and physically fit candidates can apply online for this Maha Security Guard Jobs recruitment online on or before 20-12-2017 via the official website of http://mahasecurity.gov.in.